Should a newly published sea level rise scenario come to pass, hundreds of American landmarks, neighborhoods, towns and cities would be submerged this century, at least in the absence of engineering massive, costly and unprecedented defenses and relocating major infrastructure. Ocean waters would cover land currently home to more than 12 million Americans and $2 trillion in property. This extreme rise scenario, considered unlikely but increasingly plausible, was published together with other projections in a technical report by the National and Oceanic Atmospheric Administration in January. NOAA added “extreme” as a new sea level category in the publication, supplementing high, intermediate and low categories that have also been used in past reports. The new term reflects recent research suggesting that some parts of the Antarctic ice sheet may begin to collapse much sooner than scientists had previously anticipated, particularly if ongoing emissions of heat-trapping gases like carbon dioxide and methane remain high. The extreme scenario would mean roughly 10 to 12 feet of sea level rise by 2100, depending on location, for all coastal states but Alaska — a significant departure above the global average projection (just over 8 feet). Detailed local projections are available from NOAA. The impacts of this rise would be devastating. For instance, these levels would mostly or completely inundate Kitty Hawk and Cape Canaveral; MIT and the U.S. Naval Academy; JFK and SFO; and the Jefferson Memorial and Mar-a-Lago. 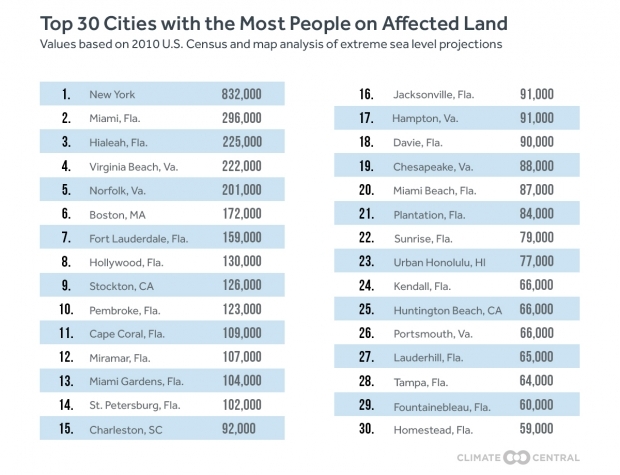 More than 99 percent of today’s population in 252 coastal towns and cities would have their homes submerged, and property of more than half the population in 479 additional communities would also be underwater (download complete table). In New York City, an average high tide would be 2 feet higher than Sandy’s flood level, covering an area currently inhabited by more than 800,000 residents. Florida would be the most affected state by total population, followed by New York, California, Virginia, and New Jersey. Hawaii and Louisiana would rank second and third by percentage of population affected, after Florida, also first in this category (download states table). These findings all reflect local sea level projections through 2100. However, under the extreme scenario, the sea would not stop rising that year. Rather, it would continue to add more than 1.5 feet per decade, and exceed 30 feet by 2200 for all coastal states except Alaska, where some locations might see 5-10 feet less. Thus, this report should not be used to judge whether some U.S. coastal places might survive 10-12 feet of rise. Rather, the analysis provides a snapshot in time to give some indication of how threatening an extreme sea level scenario could be this century. It would be far worse next century. The extreme scenario is considered unlikely, but it is plausible. NOAA’s report and Antarctic research suggest that deep and rapid cuts to heat-trapping pollution would greatly reduce its chances. Specifically, a prominent March 2016 paper indicated that a peak in annual climate pollution within several years, followed by an immediate and sustained decline steeper than the past few decades of emissions growth, could limit Antarctica’s sea level contribution this century to several inches instead of feet. Scientists are still uncertain about the chances of an extreme outcome this century, even under continued high emissions rates; understanding the likelihood better is an active area of ongoing research. What is well understood is that ice loss from Antarctica leads to sea level rise in the U.S. well above its global average effect. The reasons have to do with subtle changes in the Earth’s shape, gravitational field, and rotation due to the loss of mass from Antarctica and its transfer to ocean. One important factor is that ice sheets are large enough to exert a big gravitational pull that draws water toward them. Diminish an ice sheet, and the ocean pulls away some, leading extra water to gather toward the opposite side of the planet, which, in the case of Antarctica, includes the U.S.. Coastal states would see almost 2 to 4 feet of extra rise above the global average in the extreme scenario due to this effect, and due to sinking land in many areas, such as the Mississippi delta and the Mid Atlantic. Only parts of Alaska would see less rise than the well-publicized global average projection of 8.25 feet, due to rising land and the loss of mass, and thus of gravitational attraction from the state’s own glaciers. Climate Central used NOAA’s localized extreme sea level projections, NOAA tidal models, and lidar-based (laser-based) land elevations to identify land that could fall below the high tide line in 2100. Low-lying areas that existing levees, ridges or other features appear to isolate from the ocean at this level were excluded. 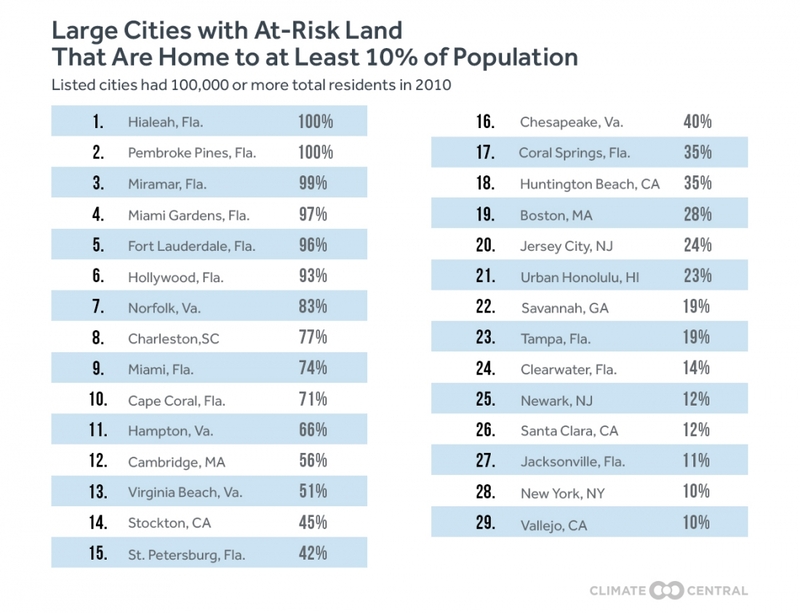 Coastal area population and property value data were overlaid against the remaining at-risk areas and totaled by city, state and nationally. In more detail, we used the median sub-scenario of NOAA’s extreme scenario, and employed linear interpolation to create a continuous surface of projected sea level increments. We added these increments to local mean higher high water (MHHW) levels from NOAA’s VDatum model in order to map the projected high tide line in 2100. Because contemporary MHHW is evaluated across the national tidal epoch, which spans the years 1983-2001, we increased local sea level increments by roughly one inch in most cases, to account for rise from 1992 (the midpoint of the tidal epoch) to 2000 (the starting year for the NOAA scenarios). Population data came from the 2010 U.S. Census, and property value from an EPA coastal property database covering 2007-8 (Neumann et al. 2010). Strauss et al. 2012 describes the core methodology used for evaluating the exposure of density variables such as these, a methodology also employed extensively by Surging Seas Risk Finder.